Costa Rica is a magical place. One full of wondrous sites and animals. I spoke about the magic in this post and my search for one of its native animals in this post. Now, let’s chat about a waterfall. When you visit here, you will immediately be introduced to the saying Pura vida, or Pure life. It isn’t hard to experience that feeling when you visit one of the many waterfalls around the country. On my last visit we hiked around a local place with howler monkeys screaming at us from the trees. This trip, we decide to visit a tourist hot spot. 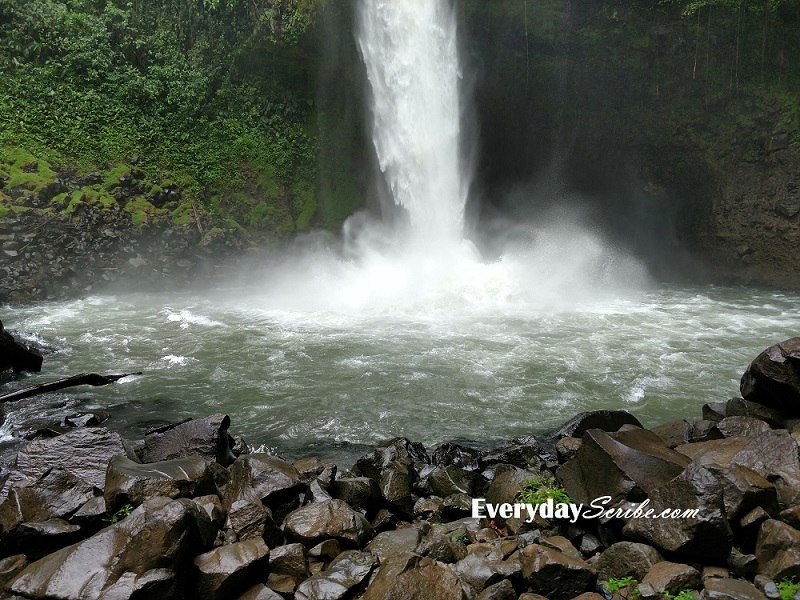 As its name suggests, La Fortuna Waterfall is located just outside of La Fortuna and it is an easy drive from the city center. We arrive at the entrance and park almost at the front door. Visiting during the rainy season has advantages. We walk up to the counter, pay our USD$15 and enter the park. 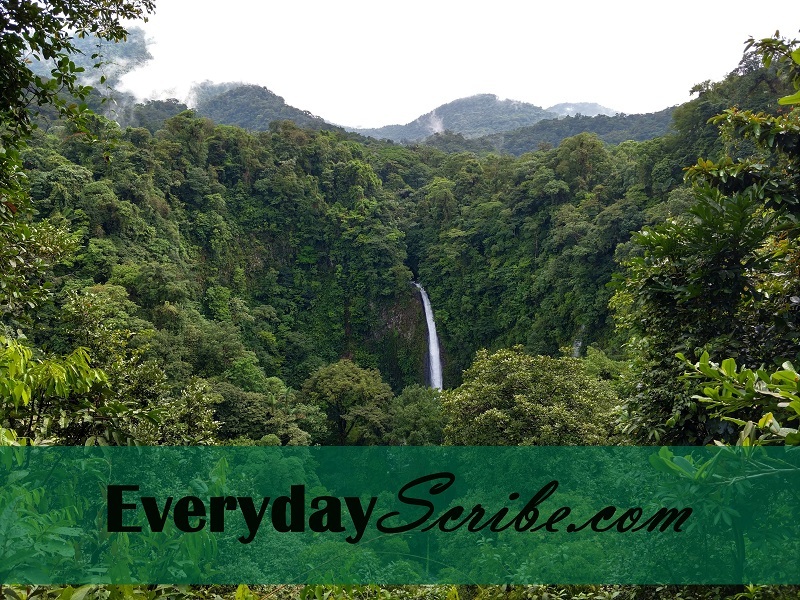 La Fortuna Waterfall is part of the Arenal Volcano National Park. The entry fee directly supports the maintenance and conservation of this natural area. We know there are over 500 stairs leading us down to the base of the waterfall, but there is a lookout with a view of the waterfall before you even step on a stair. A handful of people say they didn’t need to walk down the stairs to take in the beauty, because the view here is breathtaking. The view from the lookout is amazing, but we want to be down at the base. The stairs are wide and mostly made of concrete with many places to rest along the way. Guru Sloth provides inspirational motivation as well, but, if you can, wait to read these on your way back up. You’ll need it more then. We reach the base of the waterfall on shaky legs, but every step was worth it. It is beautiful, peaceful. We stand on the rocks at the base for a while, taking pictures and soaking in the spray. You cannot swim here; the current is too strong, but you can swim in the pool just down from the falls, so bring your swimsuit. We make our way over to the swimming area, which is really just around the bend from the waterfall. A few people are in the water, with their swimsuits on (a changing room is located at the entrance for those who plan ahead). I have a swimsuit in my backpack, but didn’t take the opportunity to change when I had it. Still, I can’t allow this moment to pass without at least getting in the water. I take off my shoes and leave my backpack on the shore for friends to watch as I wade into the water. It is a bit chilly, but it is welcome after the long walk down in the September humidity. After a few minutes and a few selfies, I reluctantly get out of the water and awkwardly put my shoes back on so we can begin the journey back up the 500 plus stairs. The rest areas and Guru Sloth are much more appreciated going up. When we reach the top, we walk through the Orchard Garden. It is a shorter trail with no stairs, so it allows our legs some recovery time before getting back in the car. I highly recommend you walk the Orchard Garden path after visiting the waterfall. This adventure is one of the highlights of the trip. I was a little worried because of the touristy nature of the place, but it is well worth the money and the effort. And, don’t forget your swimsuit!